Previously, I wrote about driving a sand point well here and here. Surprise, it didn't work out as we'd planned. With no well for water at the time, an alternative plan was put into action. 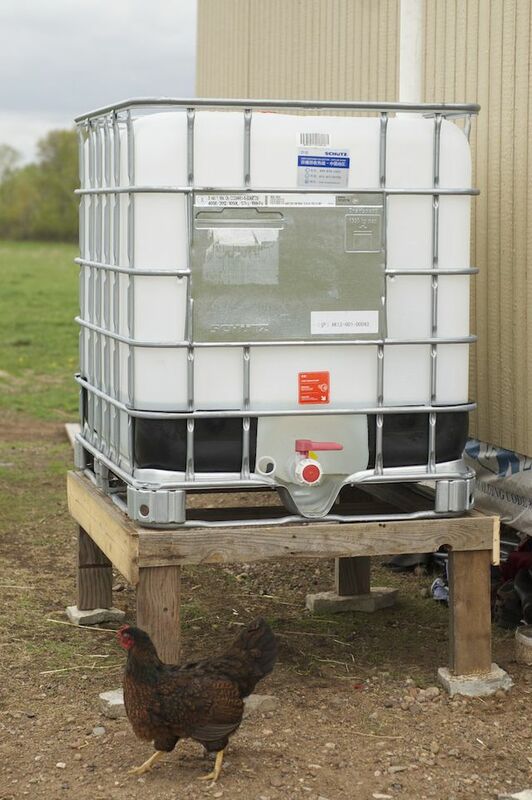 We did have the roof of the chicken coop to collect rain water, so we picked up a barrel and hooked it up to our salvaged gutters. 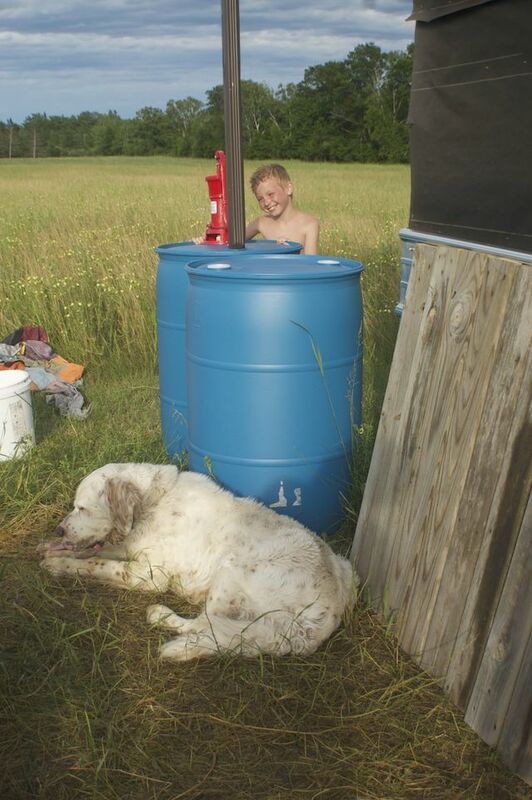 After one rain, the barrel overflowed, and we added another. That kept us in water all summer for animals, washing dishes, solar showers and laundry. Did you know the average family uses 400 gallons per person per month? We were using less than that for our whole family per month. We do refill five gallon containers in town for drinking water and are saving for a Berkey to eliminate that cost. This week, we put up a gutter on the house and added a 250 gallon tank to our water system. In just a few minutes of rain this morning, you can see how much water we've collected! Mike also made a platform and raised the tank off the ground, just enough to get a five gallon bucket under the spout. It makes life so much easier! Next, we're going to add another gutter and barrel along the mud room's roof and hook that up a drip irrigation system out to the garden. I'm also hoping to add one more to the roof of the barn for back up. We're still working on the well, and have actually made some progress. It seems that the rock we'd hit last fall has shifted over the winter and we've been able to go a few more feet. The neighbor guy says we've got to be close now. To test for water in a sand point well, you fill up the pipe and if it drains out quickly, then you know you've hit water. Ours is draining, but not quickly enough, so we pound a few inches and check. It's really hard work and because our rain system works, it just hasn't been a priority. I would love to have it done before winter though. Melting snow for washing is tedious work. If you have any questions specifically about how our water system works, we'd love to chat, so please ask!